Croup (or kroop) is a viral infection in children that causes swelling in the trachea (windpipe) and larynx (voice box). It's quite common and scary for both kids and parents. Luckily, it's usually not serious. Like some other childhood viral infections—such as roseola, which causes a fever followed by a rash, or fifth disease, which causes a bright-red rash on the cheeks—croup has distinctive symptoms and is generally easy to recognize. There's no formal test for croup. Your child's pediatrician will most likely diagnose it based on the presence of certain telltale symptoms. Difficulty breathing and inspiratory stridor: This harsh, loud, high-pitched noise that kids with croup can make when they take a breath may be confused with wheezing. If your child has croup, the symptoms are likely to be worse at night, when they're agitated and better during the day, when they calm down. Symptoms can also get better when your child is exposed to cool air, which explains why many children get better on the way to the emergency room. Mild croup: Kids with mild croup are alert and don't have a bluish discoloration of their skin or nails (cyanosis), which means their blood is supplying enough oxygen. They also don't have retractions, which is sucking in of the skin around the ribs and the top of the sternum (breast bone). They may have a barking cough. Stridor isn't present when they're resting but it may occur as they cough or cry. 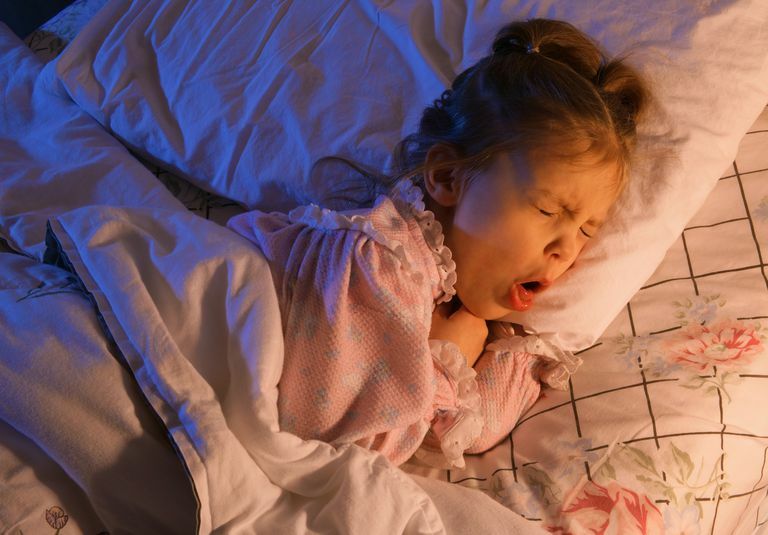 Mild croup can become more severe intermittently throughout the course of the illness, especially during the evening hours. Moderate croup: Children with moderate croup may have stridor and retractions at rest, may be slightly disoriented or agitated and may have moderate difficulty breathing. Severe croup: Retractions are a sign of severe croup, and a child with severe croup has stridor and retractions at rest. These include an inward movement of the sternum or skin between the ribs as the child struggles to take a breath. He or she may appear anxious, agitated, or fatigued. Cyanosis is common when the child is moving or crying, but then progressively worsens and becomes noticeable even when the child is resting. Croup produces a very distinct cough, said to sound like a barking seal. If you're not sure what that sounds like, you can search for "croup cough" videos on YouTube to get a better idea. A croupy cough sounds much different than any another cough your child will have with a cold, asthma, or bronchitis. The distinctive cough occurs as the infection progresses from the nose and throat to the windpipe, and the space available for air to enter the lungs narrows. If you suspect your child may have croup—especially if you think your child may have severe croup symptoms—call your child's pediatrician right away. Your child's doctor can help diagnose croup and figure out the best way to treat the condition so your little one can feel better fast. If your child has croup, your doctor may prescribe a steroid to help reduce any inflammation in his or her airway. A child with a severe infection may need to be hospitalized. At home, you can make your child more comfortable by setting up a humidifier or sitting him in a bathroom (not in the shower) filled with steam generated by running water from the shower. If she's agitated, try and remain calm as to better help her relax—anxiety can worsen symptoms. Fluids and fever reducers can help manage symptoms as well. If you're concerned your child's infection is not clearing up, don't hesitate to call your doctor. Make sure everyone in your house washes their hands often. Throw away dirty tissues from runny noses and sneezes right away. Wash toys in hot soapy water if a sick child has had them in his or her mouth. Ask people with a cough to avoid kissing or playing with your child. American Family Physician. Croup: What You Should Know. Smith, Dustin K, et al. Croup: Diagnosis and Management. American Family Physician. 2018 May 1;97(9):575-580. UpToDate. Croup in infants and children (Beyond the Basics).